American Shorthair cats have won the hearts of households around the world with their calm temperament and low maintenance lifestyle. They make a great pet for a first-cat family because of their easy going personalities. Although the exact origins of American Shorthair cats is unknown, it is likely that they were some of the passengers on the Mayflower dating back centuries. They earned their worth by keeping boats and houses free from rats. In the Early 20th century, breeders started a program to establish the best qualities of American Shorthairs. 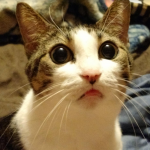 American Shorthair cats are often confused with the more mainstream domestic shorthair, the most common type of cat that most people are familiar with. But in reality, the American Shorthair is a pedigreed, purebred kitty that has quite a few show standards. American Shorthairs are medium-sized, ranging from 7-12 pounds. They are muscular cats that are agile and playful. Likely from their rat-hunting lineage, they still love to play and hunt around the house. They have large, round heads and their eyes are very round and expressive. American Shorthair fur is short and soft. This breed comes in more than 80 colors and patterns. The most common are solid, tabby, calico, tortoise, and bicolor. 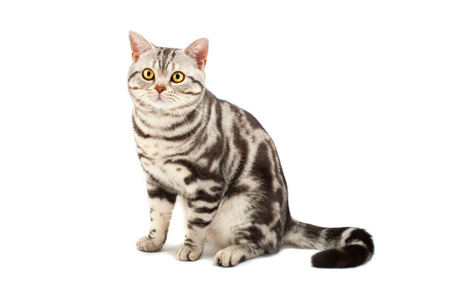 Some of the more classic American Shorthairs even have stripes like a little tiger. American Shorthairs are a great pet for families with children, cat-friendly dogs, or anyone who wants a companion by their side. They are more independent than other purebreds, but also love the attention of their owners. They are hunters at their core and will love lots of toys and games with their owner. American Shorthairs are neutral in terms of energy levels. They enjoy a good play session, but are also happy napping in a warm windowsill. They aren’t overly clingy or demand attention, but are more than happy with an ear scratch and belly rub here and there. These cats are perfect for a first-time cat owner because of their docile nature and easy-to-maintain lifestyle. Luckily, American Shorthair cats descend from a sturdy genetic line and aren’t predisposed to any major health conditions. The American Shorthair cat lifespan is from 15 to 20 years, but owners should still monitor their kitties for obesity, hypertrophic cardiomyopathy, and hip dysplasia. American Shorthair cats are more prone to obesity, which can cause a myriad of other health problems. It’s important to monitor your cat and make sure he maintains a healthy weight. By limiting his food intake, exercising him regularly, and keeping up with regular vet visits, you can completely prevent this condition. It is up to you to make sure your American Shorthair stays healthy. While this condition is not specific to American Shorthair cats, hypertrophic cardiomyopathy (HCM) is the most common heart condition in cats. This condition causes the walls of a cat’s heart muscle to thicken, and it can also cause the heart to increase in size. This is a genetically inherited condition and it is important to check with your breeder to see if your cat has this condition in his lineage. HCM is something to always be aware of, even if your American Shorthair is completely healthy. Hip dysplasia is a hereditary defect of the hip socket. It varies and the spectrum includes minor discomfort to complete paralysis. American Shorthairs suffering from hip dysplasia may move slower than other cats of their breed, avoid jumping too high, or cry. If you are purchasing an American Shorthair, make sure that they descend from a line that has had their hips x-rayed and graded by a veterinary orthopedic specialist. To ensure that your American Shorthair cat is happy and healthy, schedule annual vet appointments and check their weight, heart health, and hips regularly. American Shorthair cats don’t have any highly specialized grooming needs but benefit from weekly brushings to clear out any dead hair and debris. Their fur is short, hard in texture, and shiny. The color can affect the texture, and some breeders think that an ideal coat is brown tabby. In fact, tabby and tabby with white are the most popular for showing. People with cat allergies may want to shy away from an American Shorthair because even though they don’t shed as much as long-haired breeds, they do shed and their fur has dandruff and oils that cause allergies. As loveable as these little kitties are, they might not be the best friend for someone who suffers from fur allergies and reactions. Are American Shorthairs Good with Kids? Yes, American Shorthairs are a great choice for a family with young children, cat-friendly dogs, or just a couple or individual looking to bring a new kitty into their lives. They are low maintenance and tolerant to change, which makes them able to adapt to all kinds of households. American Shorthair cats are a classic because of their calm temperament, adaptability, and low maintenance. They are a great fit for the owner that doesn’t want to invest too much time or money into grooming, but still want a furry companion around the house. Your product has worked an absolute miracle on Gracie! She is pretty much back to her old self again. I can not say Thank You enough! !